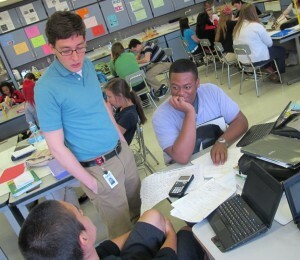 Evansville science teacher Brian Bennett speaks with students in his chemistry class. Outside of class, students watch video lectures Bennett records, allowing them to do their homework with Bennett's guidance in class — the so-called "flipped" model. When high schoolers in Brian Bennett’s chemistry class need a refresher on the ideal gas law, they don’t call for the teacher — they pull up a video of the teacher. “Remember n equals moles,” Bennett reminds his students in a video he made weeks earlier — one of dozens he’s produced for his science classes. Bennett uses the videos as part of his “flipped classroom,” an instructional model that turns traditional teaching tactics upside down. Teachers in flipped classes send students home with videos of lectures they’d normally hear in class, freeing them to use class time to personally assist students with assignments. Bennett’s message? Good videos aren’t as important as good teachers. 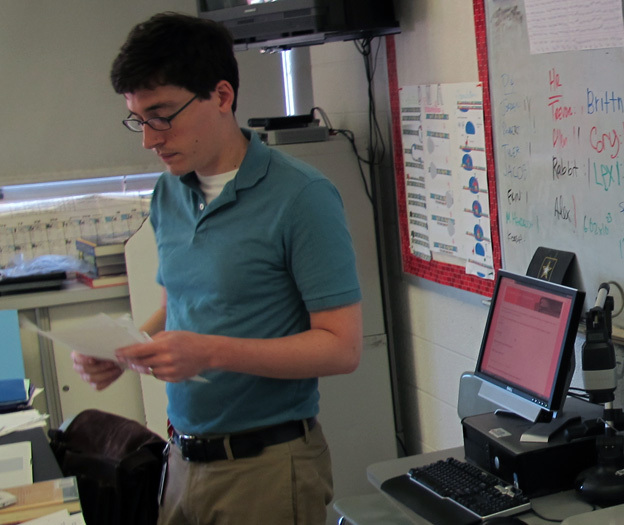 After being developed by individual teachers for years, the flipped classroom is now being implemented on a broader scale with the backing of Indiana education officials — and state dollars. In March, the Indiana Department of Education awarded a $200,000 innovation grant to the Richmond Community Schools to help 15 teachers flip their classrooms next year. District officials estimate the move will impact roughly 200 students. Plymouth Community Schools received a similar grant in 2011 and another $100,000 in grant money this year. Richmond Community Schools technology coordinator Rob Tidrow says the flipped classroom allows students to engage with instructional material in a medium where they’re comfortable. “Technology is in the hands of the students almost 24/7,” Tidrow says. Students see a big upside to having video lectures available online. The videos become living reference materials, they say, accessible at any time. Salman Khan demonstrates how he records virtual lessons — instrumental in the "flipped classroom" — for CBS's 60 Minutes. While StateImpact found two of the Indiana teachers who have flipped their classrooms using videos they made themselves — we profiled Indianapolis’ Troy Cockrum last year — the name you’re most likely to have heard associated with the flipped classroom is The Khan Academy. In March, CBS’ 60 Minutes profiled the not-for-profit company, which makes online video curriculum, and its namesake Sal Khan. Videos on the company’s YouTube channel have been viewed more than160 million times, and Khan Academy’s website has gotten more than 40 million visits from the U.S. alone in the past 18 months, CBS reported. “We’re trying to take the passivity out of the classroom, so that teachers have more flexibility,” Khan told interviewer Sanjay Gupta. I see turning all the instruction over to Khan Academy as the same thing as buying an instructional program from a company and just handing out worksheets. Me making the videos is personal, because I know what my kids need. If we’re working on a concept, and they need extension on it, I’ll go and I’ll make a new video and it will fill that purpose. Will I use that video next year? Probably not. With something prepackaged like Khan Academy, exclusively Khan Academy, they might not do that extension, they might not do that revision, which is a problem. Because if we’re not revising, we’re not going to be able to grow each individual student in the way they need to be grown. In his 60 Minutes interview, Khan said teachers take an active role in instruction even if they aren’t creating the content themselves. “We kind of view teachers playing the role of more like a coach or a mentor. Which, once again, I personally believe is a much higher valued thing than a lecturer,” Khan said on CBS. Evansville teacher Brian Bennett in his classroom at Harrison High School. Teachers who’ve flipped classes with their own videos say creating the lectures can be a labor- and time-intensive process. But Bennett says software to create the video lectures is becoming much easier to use. Our teachers know the students the best, and they know how to structure their lessons accordingly. We’re not removing the teacher from the equation at all… We also want that teacher to be familiar with that lesson. The next day when the student comes in, they’re going to have questions. Hey, I saw at minute three, you talked about this concept, can you expand on that? We want the teacher to be aware of what the lecture is. Generally, though, not everyone’s sold on the idea of the flipped classroom. Because it relies on students having access to technology at home to watch the videos, The Hechinger Report writes the model hasn’t crossed the socio-economic digital divide, remaining far more popular in wealthy schools than in poorer ones. And — as some critics have told us — there are educators who don’t like the idea that the flipped classroom is becoming popular just because it features “something shiny” like online videos, without elevating good pedagogy. Indeed, Bennett says the flipped classroom has to put quality instruction first if the model is to become anything more than a fad. What do you think of the flipped classroom? Have you seen it in your school? Would you like to see it in your classroom?